Who couldn't use an extra $1000 on school clothes for your kids? I know I could, as clothing is so expensive now day, and if you have more than one child, oh my goodness, you could go broke getting their new wardrobe. 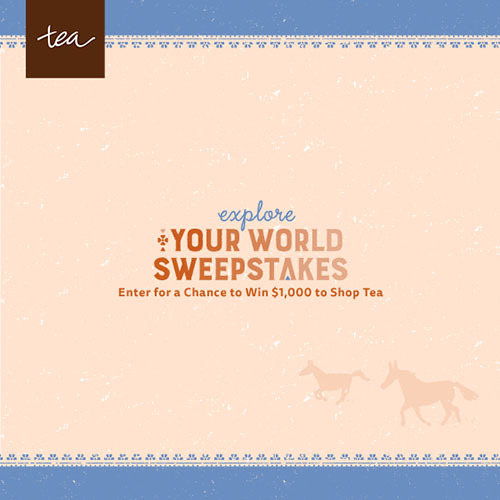 Not only is The Tea Collection giving away $1000, but they are making it a fun family event that will create many memories that your children will remember forever. All you have to do is go to the Tea Collection Website and then you will download the Explore Your World activity list, then grab your camera, and start taking photos as your complete your activities. Then you submit your entry. So you don't want to do all of the activities? That is just fine, each activity is a new entry, so if you complete all the activities, you will have 15 entries!!! Just remember to complete the activities and enter before September 30, 2015. Happy Adventures, and Good Luck to you all!!! Yes I agree I think everyone could use the extra money for clothes. I know I still could. I really could of used it 10 years ago when all 6 of my children were going to school.